David Ribbans says he is really enjoying the fresh style of play at Saints. And the lock is now hoping his side can back up last Friday's success against Harlequins when Saracens come calling at Franklin's Gardens on Saturday. Ribbans was named man of the match in the 25-18 home victory against Quins. 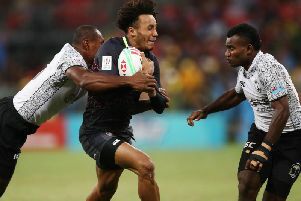 The 23-year-old carried superbly, defended well and led the lineout, continuing to savour the extra responsibility given to him by the new coaching set-up at the club. And Ribbans wants Saints to continue their progression against a Saracens side who won all four meetings between the teams in emphatic fashion last season. "We're at home again and we've got to make this place a fortress so we're looking forward to it," the South African second row forward said. "Last season's in the past now and we've got new players, new coaches and a new team this season. "It's going to be difficult but we'll see what we can come up with. "We want to put on a good show at Franklin's Gardens." Ribbans admits he was slightly shocked to be named man of the match in last week's game. He said: "I think it's my second one (man of the match award at Saints) and I was a bit surprised about that because I was definitely blowing at times! "It's a bit of a cliché but it was definitely a team performance and the boys put in a big shift. "I was just lucky that I was the one who got the award at the end. "The new coaches have given myself and Courtney (Lawes) a chance to get involved in the game a lot and make some carries, which is something we enjoy doing. "They want us to be dominant in that role and I'm enjoying it." Ribbans, who joined Saints in January 2017, has helped to fill the void left by Christian Day, who retired during the summer. And it seems the former Western Stormers player has made a big impression on new boss Chris Boyd and Co.
"It's a new coaching staff and new ideas so you're not guaranteed a spot," RIbbans said. "I'm really enjoying working with Ferg (assistant coach Matt Ferguson) and Dows (forwards coach Phil Dowson). "There are new ideas and I'm really enjoying it."